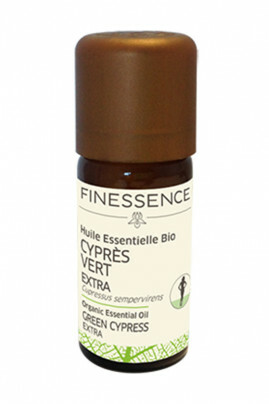 Finessence Organic Green Cypress Essential Oil is known in aromatherapy for its circulatory and tonic properties. Draining and decongestant venous, it is ideal in case of heavy legs, varicose veins and cellulite. Balancing, it also regulates excessive sweating. Thanks to its soothing properties, it calms sore throats and improves respiratory comfort. Its sweet and balsamic fragrance purifies and cleans the atmosphere of a room. Atmospheric diffusion : Add a few drops of essential oil in your diffuser. Observe the manual of your device for dosing and diffusion time. Cosmetics : In a vegetable oil spoon such as Organic Pure Apricot Oil, add 3 to 4 drops of essential oils. Massage gently on the affected area. Infusion : Mix 3 to 4 drops in one liter of warm water. It is important to dilute the organic essential oil in honey or on a piece of sugar that you will then add in warm water. An organic and natural concentrate! Cupressus sempervirens (green cypress) extract, linalool*, limonene*. Dangerous. Comply with precautions for use. Contains: alpha-pinene, delta-3-carene, limonene, beta-pinene. May cause an allergic skin reaction.